The Latino Leaders Network, a non-profit organization dedicated to bringing leaders together, honored Mayor Sylvester Turner tonight with the Antonio Villaraigosa Leadership Award at its 30th Tribute to Mayors. The award is presented to a mayor from a city with a significant Latino population who has exhibited an outstanding commitment to bringing diverse communities together. Mayor Turner was nominated for the honor by Houston leaders including Congresswoman Sylvia Garcia, State Sen. Carol Alvarado, Council Member Robert Gallegos and County Commissioner Adrian Garcia. 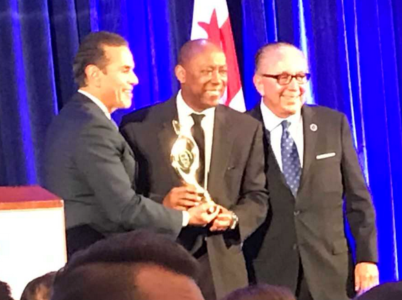 Former Los Angeles Mayor Antonio Villaraigosa presented the award to Mayor Turner. The Tribute to Mayors is a private event held during the United States Conference of Mayors winter and summer meetings. Attendees included mayors, other elected officials, policy-makers, corporate executives, community leaders, and industry expert. Event sponsors included Bank of America, Anheuser-Busch, Southwest Airlines, Walmart, HMS Host, HDR Inc., Hudson Group, Waste Management, Verizon, Parsons, and Jacobs.